Create a backup of everything that is (or may be) important for you! Deregister add-ons licences registered in FSX. Remove add-ons through the Control Panel. Remove FSX through the Control Panel. Remove registry information (optional – only for advanced users). Always keep all data that can be used again – settings and config files, saved flights, etc. Copy them to a backup folder. Before you delete any folders – make sure that there are no important files among them. In doubt – just make a copy of the whole folder or simply rename it (it’s a good way to keep folders you intend to remove – rename them adding _backup to their name and leave them in the same location. Keep in mind that you (probably) have a very large hard drive – a few additional megabytes (or even gigabytes) will not make a difference. I suggest you keep copies of all the folders I mentioned in part 6 of this guide. Some add-ons (like PMDG planes or FlightBeam and FSDreamTeam sceneries) require a licence key that is registered in your FSX (and on a publisher’s server). To reinstall these add-ons without any problems – remember to deregister them. You can deregister PMDG 777 using planes FMC. FlightBeam, FSDreamTeam and several other companies use an Addon Managera (you will find it under Add-ons in FSX menu). You will deregister these add-ons using the same window that you used to register them. The next step to uninstall your FSX is add-on removal. Go through “Programs and Features” section of the Control Panel and uninstall some add-ons. Which add-ons should you uninstall? Do not remove sceneries that you have added to your Scenery Library manually unless you think that the installer added some files to your core FSX folder (for example the installer can add something to the Effects folder). I have a folder where I keep all my “manually added” sceneries (mostly freeware but also several payware that have normal installers). This folder “lived through” several FSX installations. Keeping it saves me time when I reinstall my system or FSX. A note – if you have a folder like this (I called my Sceneries_Direct – for the direct installation of this sceneries) – do not add any sceneries that make you add files to “Effects” folder. Alternatively you can create an Effects folder inside your Sceneries_Direct to keep copies of all effects. Then – if you want to reinstall your FSX you will just copy the contents of entire Effects folder to your new FSX installation. If your are not sure whether to remove any files or not – remove them and install them again in your new FSX. Once again – when in doubt – reinstall. Remove add-ons that are integrated with your FSX. Especially all the add-ons that modified dll.xml or exe.xml files. Usuń all add-on planes. It’s better to reinstall them into your new FSX. Usuń the software that connects to Vatsim or IVAO networks. Note – to avoid confusion let me clarify this – in this step you need only to remove add-ons that have uninstall entries in “Programs and Features”. At this point you do not need to manually delete any files from FSX folder. Continue your work in Programs and Features – remove your FSX. If you have Acceleration or Software Development Kit – remove them too (preferably – before removing FSX core installation). Find FSX folder (it will still be there) and delete it with all it’s contents. If you are removing FSX:Steam Edition installed in dual mode – remove folders called FSX-SE. If you remove any any information related to system operation – your Windows may be damaged. In worst case – damages can be unrecoverable. You act on your own risk. You have been warned! We are done with disclaimers – let’s get to work. Do it only if you have to! Removal of registry information should not be necessary. If everything works fine – skip this point. It’s better to install FSX and in case of trouble uninstall it once again than to go to registry at first try. This step may be useful for those who had FSX and wish to make a clean installation of FSX Steam Edition. Still – I recommend that you tried to install FSX:SE without cleaning your registry. Only if it installs in dual mode – make the changes I described. (You can distinguish dual installation by FSX-SE folder name in C:\Users\Username\AppData\Roaming\Microsoft\FSX). You should clean registry information only if you feel that something is wrong and you can not find any other reason. I have cleaned all FSX related registry information because on my PC it was the only way to switch from a dual FSX + FSX:SE setup to a standalone FSX:SE. Once again – do only what is necessary (If you feel that I am discouraging you from messing the registry – you are right!). Most of FSX related registry keys are harmless. I suggest you get though them on part at a time checking if you have done enough. Open your registry (open command prompt, then type regedit). If you do not know what am I writing about – better stop now! You should change this paths to your’s. 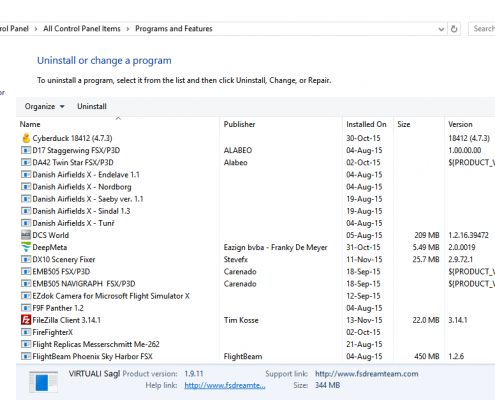 Before you reinstall FSX – reboot your PC.